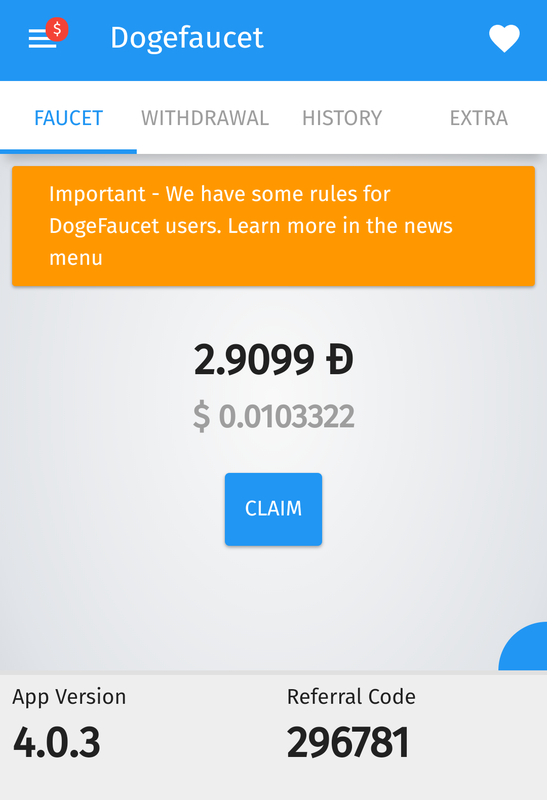 There are a lot of Dogecoin faucets, with some of them exclusively for mobile. We earlier discussed passive earning apps on Android for cryptocurrency, you can check that here. If you are looking for more active ways to earn the following list might be of help to you for legit faucets in the Google Play store or for legit Telegram bots that pay Dogecoin or another cryptoccurrency where Dogecoin is not accepted. You can claim every 4 minutes. And get 0.04 Dogecoin for each claim. Not a lot, but you can do this while you are busy with other things, making this an easy earner. 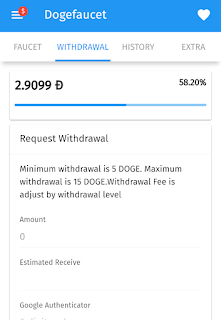 Withdrawal on the Dogecoin faucet starts at 5 Dogecoin, with a withdrawal fee of around 1.5 Dogecoin, depending on how fast you want your Dogecoin deposited. 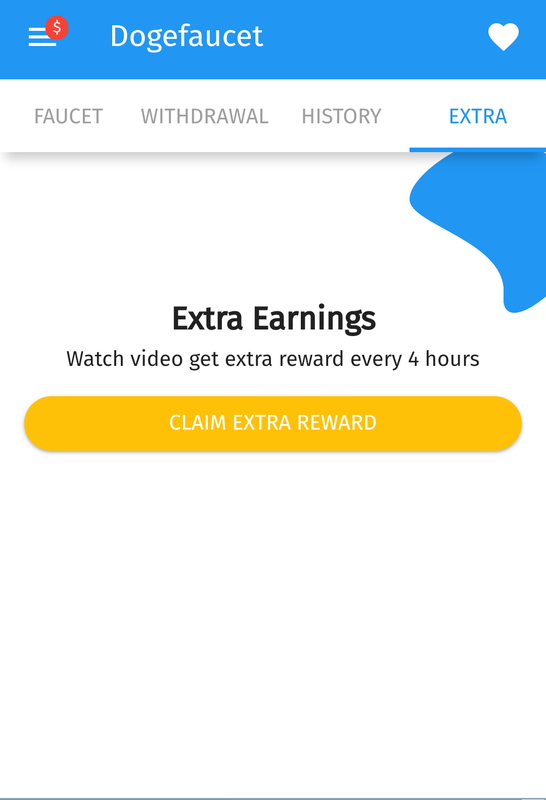 When the faucet is not enough in earnings, you can also watch videos and earn Dogecoin with that. Dont forget to use code 296781 for a bonus when registering. 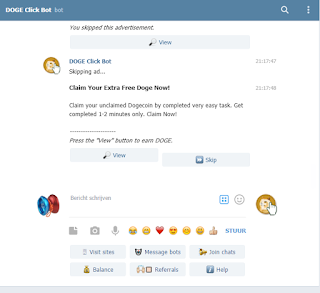 Dogeclickbot is a bot on telegram that pays you to sign up with websites. Simply go to the Telegram app on Google play, download Telegram and click on the sign up link. After signing up with the bot you press /start. Websites, Message bots, Join chats, Balance, Referrals and the help button. When clicking on the website button you get shown a link that you have to click as shown in the image. When you click that button you get taken to a site. 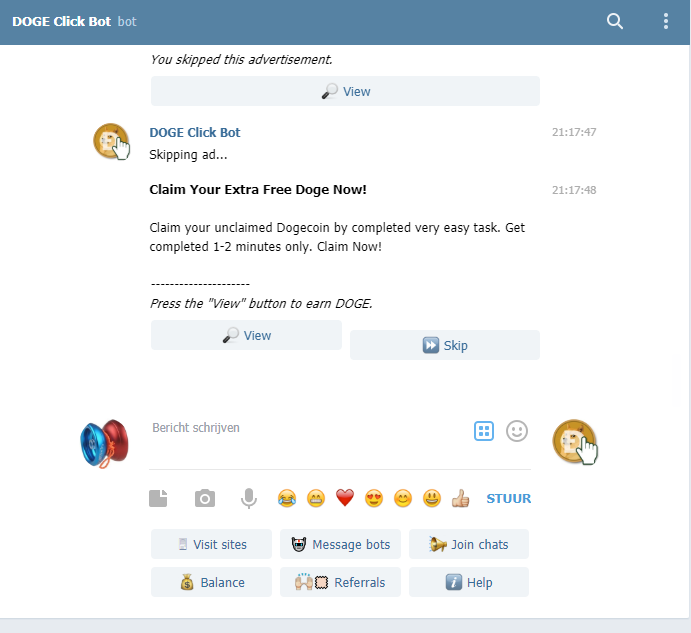 On that site you have to stay for 20 seconds, and after that you can go back to dogeclickbot and the bot will automatically add the reward to your account. When you click on message bots you get shown a telegram link. Simply press on the link and it takes you to another bot. After doing /start or clicking the menu button on the bot you got linked too the bot will respond with a message. Long press this message and press on forward this message. This button is on the upper right corner of your chat window. Forward it to the dogeclickbot. After you have done that you get your reward. This is much more profitable than watching websites but it can be annoying since the tasks for messaging bots can run out. For the join chat button all you have to do is click the link, press on join, and go back to the bot to validate the task. Balance simply shows your balance, and allows you to withdraw your balance. 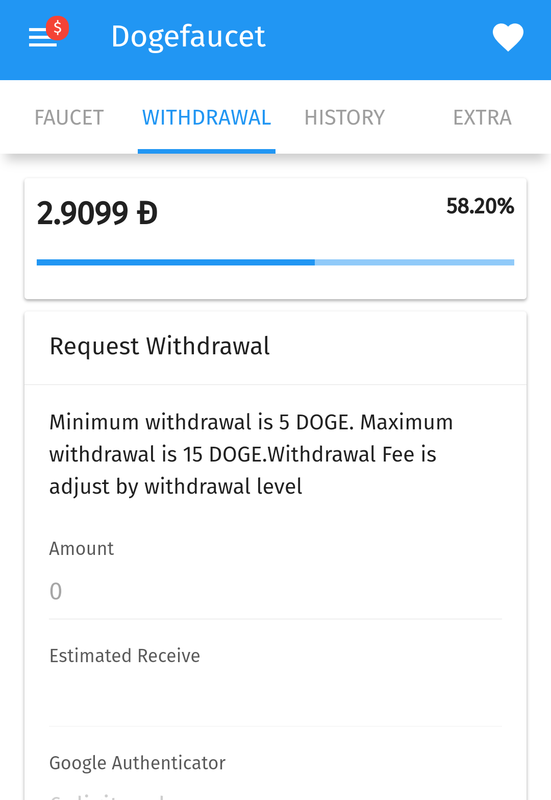 You can withdraw after you reach 3 Dogecoin, and there is a 1 Dogecoin fee. It is smarter to save up a bunch of Dogecoin so you dont pay a lot of fees. Referrals gives you a referral link, you get a percentage of the earnings of whoever you signed up. If the person clicks on your link, signs up and earns 10 Dogecoin, you get 2.5 Dogecoin on top of that. Win-win situation! Help is for the commands you can give the bot, and to ask for information about how to put your own advertisements in the bot tasks. 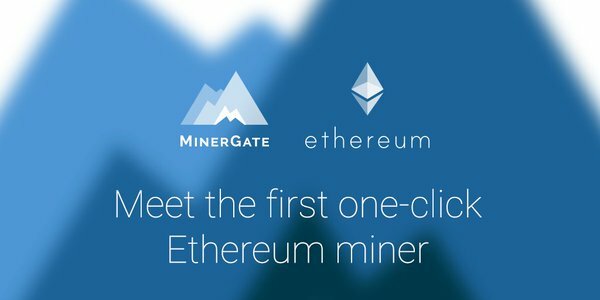 Basically the same as Dogeclickbot, but it uses Litecoin instead of Dogecoin. This bot is lesser known so the earnings are not quite as good. Another Telegram bot, but this one pays in Bitcoin cash. You can claim the exact way as the litecoinbot and the dogeclickbot. Minimum withdrawal is 0.0001 as of now. This Telegram bot lets you earn ZEC. The coin is pretty unknown but you can trade it for other crypto on various exchanges such as Crex24. One of the best faucets on mobile. Only one pop up advertisement once in a while, and you can claim a lot of coins easily. Simply sign up with coinpot.co and go to the faucets. You can collect from different faucets and get different coins, but you can easily exchange them on the coinpot site to Dogecoin. Need more income on mobile?